We are committed to producing the best third generation Minuets out there, which means that our kittens will have parents and grandparents that are nothing but Minuets. At this time, it is acceptable to use Munchkins and the Persian breed group to produce Minuets, and this is completely fine. Eventually, the standards will require that only Minuet to Minuet pairing will be acceptable. Our breeding program is modeled that way. Since our cats are second-generation Minuets, all their kittens will be third-generation Minuets. To get a kitten from Tiny Lions Napoleons, we do not require a deposit to get on a waiting list. However, once you wish to reserve a kitten from a litter, we require a non-refundable deposit ($100 for nonstandard kitten and $200 for a standard kitten) to put your name on that kitten. Anyone can get on our litter update list to be kept informed of when litters become available. Those who are on our litter update list will get in depth updates on our kittens and first choice of our kittens. Please be aware that we do not provide kittens on a first-come, first-serve basis. We find the best family for each of our kittens. 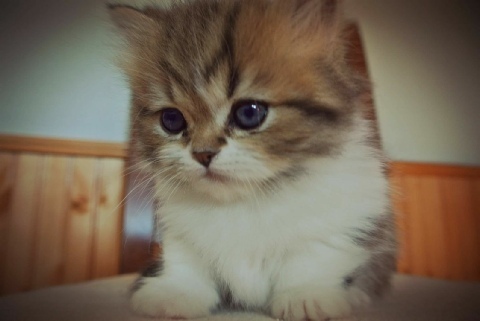 The cost of each kitten is dependent on color, lineage, and conformation standards. Cats that display show quality traits will run a little higher. We prefer to sell only kittens as pets, but we will consider selling quality kittens to a breeder if we agree with their breeding program. Such a breeding program must include their cats being family members. Otherwise, our kittens will be spayed or neutered before going home to their new family. 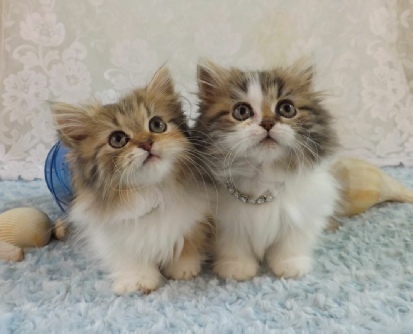 Anyone interested in a kitten for breeding must discuss their breeding program with us in depth before they will be approved for purchasing one of our kittens. If you wish to get on a waiting list, you will have to fill out a questionnaire. Only a few breeders require this, but we are concerned about where our kittens go after they leave us. Minuets are very resilient and adaptable cats, and having other pets in the house will not prohibit you from getting a kitten from us. The questionnaire will help us understand your living situation, as well as to give you a chance to reflect on the consequences of bringing a Minuet into your home. We want to make sure that you are certain about bringing a kitten into your life. Getting a kitten should be a decision you are firmly committed to. The questionnaire will help you make that decision. In addition, we can review your answers and give advice on how to incorporate your new kitten into your family. You can also find helpful suggestions on our blog. To fill out the Questionnaire, click here. 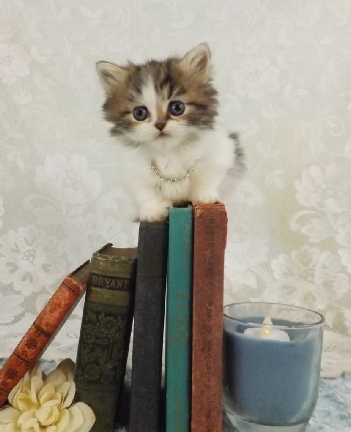 Check out our available kittens and upcoming litters on our Available Kittens page. Taking your kitten home is another matter to consider. Due to the stress that shipping in cargo causes to a kitten, we will not allow that option. You may either pick up your kitten in person or have someone else do it for you. Or, for an added amount, we will personally deliver your kitten to you if you live within the United States. International buyers should scroll down to see the requirements for purchasing a kitten from us. We are located an hour outside Colorado Springs, which has the closest airport, and two hours away from Denver International Airport. We would be available to meet you at either airport to hand off your kitten to you. Once you reserve your kitten, you will receive updates and pictures of his or her development until he or she reaches 12 weeks of age. The kitten you’ve chosen will be given a three-set series of intranasal vaccinations (at 6, 9, and 12 weeks). They will be de-wormed, receive an extensive eye and ear exam, and be given a clean bill of health before he or she goes home with you. They are guaranteed to be disease-free upon receipt and come with a one year genetic health guarantee. Your kitten will be happy, healthy, and ready to go home with you at around 12 weeks of age. Kittens must be at least 2 pounds before they will be released. Your kitten will be socialized with other cats, dogs, loud noises, strangers, and travel. It will have been acclimated to all aspects of grooming, including nail clipping, bathing and blow drying. Your new kitten will be spayed or neutered before it leave us. His or her registration will specifically state that he or she is not for breeding, but will be in your name. Registration is done in The International Cat Association (TICA). All kittens are microchipped in their new parent’s name. Please review our contract before you make a decision on purchasing a cat from Tiny Lions Napoleons. You can see a copy of it here. Tiny Lions Napoleons strives to produce the best cats of the breed and therefor will sell only kittens that exhibit the best traits as show or breeder cats. These will be determined by color and the beginning of the kitten’s development of the right conformation standards. However, since a cat continues to develop its traits well past 12 weeks, even until it reaches adult age, it is impossible to predict the exact conformation standards of any kitten by the time it is ready to go home with its new parent. It will be up to the prospective buyer to be familiar with the conformation standards of the Minuet breed to be the judge of what they are looking for in a show cat. Note: No breeder can guarantee show results in their cats, and you should be very wary of anyone who does. 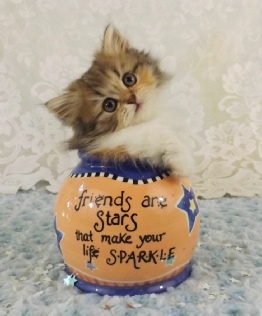 Due to their status as breeders and show cats, they will be priced higher than cats that will go to pet homes. Be sure to indicate if you are interested in a show or breeder cat. However, we will not sell our cats as breeders to just anyone. Anyone interested in a cat for breeding must prove that they are or will be a responsible breeder, according to the rules of TICA.org. (See rules here). Those people will also be vigorously vetted to make sure they will provide a loving home to their cats. Breeding rights are an additional $500. There is no additional cost for showing rights. Show Kittens: If you intend to show a kitten in TICA or other cat association, you must indicate this to us. All our kittens go home altered, unless requested by the purchaser for either breeding or showing in championship classes. A kitten that is meant for showing in championship will not be altered and will come with an additional $500 fee. Please understand that the registration will specifically state that the cat is ALLOWED to show but is NOT ALLOWED for breeding. Any kittens bred from this cat will not be registered in TICA. If we learn that you are breeding a cat from us that has not been altered because you wish to show it in championship class and we have not approved you for breeding our cat, we will file a formal complaint with TICA and pursue disciplinary action. We only sell our kittens for breeding to programs that we approve. Our selling contract will specifically state what rights are being sold with the kitten. Cats that will show in Alter Class will not carry the additional show fee and can be purchased at the pet price; however, they will be altered they go home. If you are from outside of the United States and are dead-set on getting a kitten from us, you should be aware that there are additional costs above the purchase price of the kitten. This cost can run upward of another $2,000, depending on the country you wish the kitten to go to. However, you will only be charged what expenses are incurred to get your kitten home. You will also be required to communicate with us extensively to ensure the quality of home our kitten will be going to. Remember, our priority is to ensuring the health and happiness of our cats. Under no circumstances will we sell to brokers. If you are a broker, do not even inquire about our kittens. You should become familiar with the import laws for bringing pets into your country. Prior to agreeing to sell a kitten to an international buyer, we will review the laws of that country to ensure that they are compliant with ensuring the health of the kitten during transport. We reserve the right to deny purchase of a kitten due to those laws, or any other situation where the health of the cat is not guaranteed. Note: We will not ship a kitten in cargo. You must arrange for personal transportation home, either by picking up the cat in person or having a personal representative do it for you. Funds for the cost of a kitten and shipping home must clear before the purchase is completed. The results for each cat are available for review upon request. Tiny Lions Napoleons is also interested in tracking the coloring of our kittens. For our own interest, we will DNA test our kittens for coat color. At your request, we will provide the result to you for your own interest. This is usually of interest only to someone intending to breed or show their kitten. However, DNA color coat test results will not be a reason for returning your kitten in the event the kitten does not possess a coloration gene you are looking for. If you are looking for a specific gene, check our Lions and Lionesses page to request their DNA results. You will be able to see the possibilities of the pairings to judge for yourself what color your kitten carries if it is not evident.